CorruBracket™ can be used to mount almost anything to corrugated metal roofing and is compatible with 7/8″ and 3/4″ corrugated roofing. The CorruBracket™ comes with factory-applied butyl sealant already in the base, and the S-5!® patented reservoir conceals the sealant from UV exposure, preventing drying and cracks. The CorruBracket has been tested for load-to-failure results on wood decking, metal and wood purlins. The independent lab test data found at www.S-5.com can be used for load-critical designs and applications. S-5! holding strength is unmatched in the industry. Due to the various applications, CorruBracket does not come with bolts. 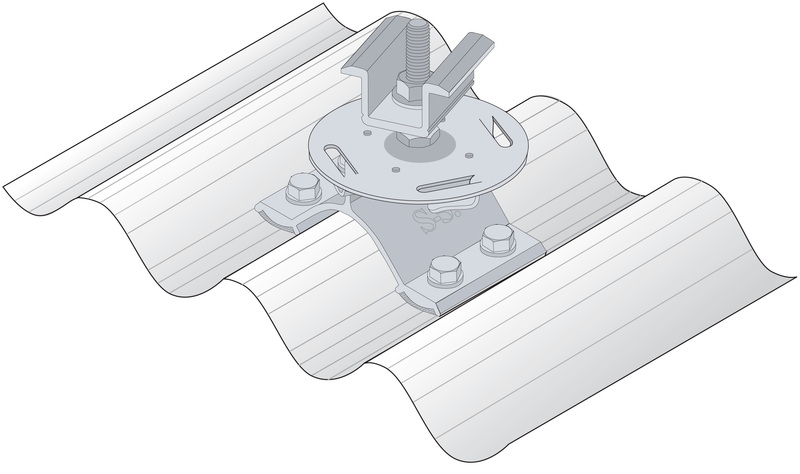 Strong enough for heavy-duty applications, the CorruBracket is the perfect match for S-5!’s ColorGard® snow retention system, and the easy installation makes it the best solution for installing photovoltaic solar arrays to corrugated roofing with the S-5-PV Kit. Installation is simple! CorruBracket is mounted directly into the supporting structure of the roof, i.e. roof decking, wood or steel purlins, or trusses. No surface preparation is necessary; simply wipe away excess oils and debris, peel the release paper, align, and apply. Secure through the pre-punched holes using the appropriate screws for the supporting structure.